Choose the folder you want to export. 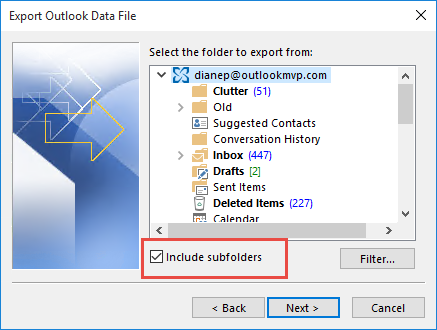 To export the entire data file, select the top level folder and check the option to include subfolders. Depending on the number of items being exported, the export process can take a few seconds to a few minutes. Always export in an appropriate format. For example, if you are exporting contacts to use with another copy of Outlook (or as a backup), export to Outlook data file (pst). If you are exporting IMAP folders, the messages might be hidden. Change the view or see "Fix the Outlook Folder Type after Exporting an IMAP Account" for a macro to fix the folder type. Don't use Export to backup your Outlook pst file. Find and copy the PST file to back it up. See Where is Outlook's PST file? if you need help finding the PST file.